Silk; Mohair; Cashmere, camel hair and other hair fibres. 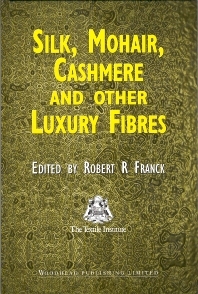 Appendices: International trade rules for raw silk and other products of silk; Spider silk; Composition of mohair fibres and of amino acids; Mohair yarn spinning and properties; Mohair fibre and fabric properties; Mohair dyeing and finishing; Mohair product list; Rules for the use of the mohair trade mark (label); Scotland and China and cashmere trade; Quality assessment of goat hair for textile use; Luxury flame retardant fabrics for aircraft applications. Although none of the luxury fibres, including silk, is produced in large quantities, their particular and unique qualities of fineness, softness, warmth and pleasurable handle mean that they occupy a very important place in the luxury apparel and fine furnishing trades. This book covers all aspects of the growth, physical characteristics, production, marketing and consumption of silk, mohair, cashmere, camelhair, Alpaca, Llama, Vicuna, Guanaco, Yak and Musk Ox fibres. The image of these fabrics is of course all important and the book describes in detail those rare occasions when a lower priced and lower quality version of a luxury fibre has damaged its overall reputation. Some natural fibres covered here including spider silk are also increasingly finding applications within the technical textiles sector where their high performance thermal properties and bio-mimetic qualities in particular, are very useful. This is an essential reference for all those involved in any part of the luxury fibre trade. After graduating from the Scottish Woollen Technical College (now the Faculty of Textiles of Heriot-Watt University), Robert R. Franck started his career in textiles in the marketing department of ICI’s newly formed Fibres Division. During the next 20 years he progressed to be the Manager of the fibre sales department of ICI’s French subsidiary. After a period as Sales Director of a large French worsted spinner he joined International Linen, the promotional and development organisation of the Western European flax industry, where he was a member of the international management team with particular responsibilities for the UK and Far East. He also took an active part in new product development. On retiring from International Linen he set up his own consultancy and has undertaken projects for companies and governmental organisations in Europe, Australia and the Far East. He is a Fellow and past Member of the Council of The Textile Institute and a Fellow of the Royal Society of Arts.